Credit: Norman Kuring, NASA's Ocean Biology Processing Group. MIAMI–Scientists are studying the oxygen-deprived waters of the Black Sea to help answer questions about the deepest parts of the ocean and Earth's climate. A new study led by researchers at the University of Miami (UM) Rosenstiel School of Marine and Atmospheric Science found that even in the absence of oxygen, the chemical and biological processes occurring in the Black Sea resemble those in the oxygenated deep ocean. These results provide new insights into the role that the deep ocean plays as a storage reservoir for carbon, a process that helps to dampen the effects of human-driven climate change. "Understanding such processes is especially important today since oxygen in the ocean is decreasing, largely due to the warming of ocean waters driven by climate change," said the study's lead author Andrew Margolin, a postdoctoral researcher at the College of William & Mary's Virginia Institute of Marine Science and an alumnus of the UM Rosenstiel School. Even in the absence of oxygen, the research team found that the respiration of organic carbon occurring in the anoxic waters of the Black Sea is not as different from that occurring in the deep ocean. One hypothesis has been that decreased oxygen in the deep ocean may weaken respiration of organic carbon to CO2, causing organic carbon to accumulate there. The accumulation of organic carbon in the deep ocean would limit the release of carbon into the atmosphere as CO2, limiting further warming by this greenhouse gas. Understanding the exchange of carbon between the ocean and atmosphere is vital to understanding global climate and its past, present and future variability. The oceans have absorbed approximately one third of human-produced CO2 emissions, dampening the effects of carbon dioxide-driven greenhouse warming. One of the pathways for the ocean to naturally sequester carbon from the atmosphere is by storing it in the deep ocean as organic carbon for hundreds–if not thousands–of years. Researchers analyzed seawater samples collected from the Black Sea aboard the research vessel Pelagia as part of the international GEOTRACES study. Samples were taken from the sea surface to the seafloor at a depth of 2,200 meters (1.4 miles), frozen and then shipped to the Biophysics Institute in Pisa, Italy where Margolin conducted the analyses. 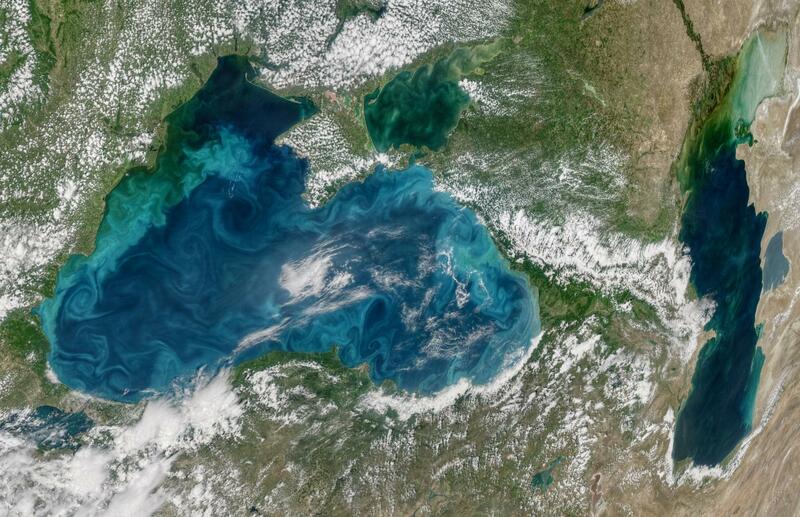 The Black Sea, bordered by Ukraine to its north and Turkey to its south, is the largest anoxic sea on Earth, making it an ideal natural laboratory for marine geochemists to study the processes of carbon transformations in the absence of oxygen. "Insights into oceanic carbon transformations–including the oxygen dependence of organic carbon respiration–can be gained by studying the anoxic Black Sea," said Margolin. The study was supported by the National Science Foundation through grant #OCE-1436748 and a NSF Graduate Research Fellowship Program (grant #DGE-1451511), a 2015 Mary Roche Fellowship, the Promoting Excellence & Recognition Seal of European Aerospace Universities (PERSEUS) Project of the Seventh Framework Programme and The Ocean of Tomorrow, European Commission (grant #287600, the Italian Flagship project La Ricerca Italiana per il Mare (RITMARE), Italian Ministry of Research and University.